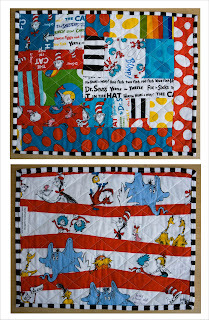 I have been busy creating lots of little and not quite so little things from my Dr. Seuss fabric. As I already mentioned in my pervious post I find myself unable to keep up making quilts for all the babies being born around me and what's more those who were born last year are now coming up to their first birthday !!! (who would have thought). 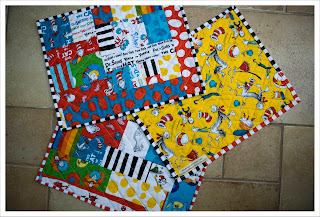 So I spend last week making presents and actually giving some of the finished items already as presents to my friends only to ask them back right after they were unwrapped with the excuse that I still needed to take a photos for the blog and flickr.......some eyes were rolled indeed. So let me show you what I have been up to. Starting with the sligher larger items and working my way town to the tiny bits. I cut strips of varying sizes from all the individual prints and pieced the fronts together in a more or less random fashion. I made sure that I had some larger pieces with figures on as eye catchers. 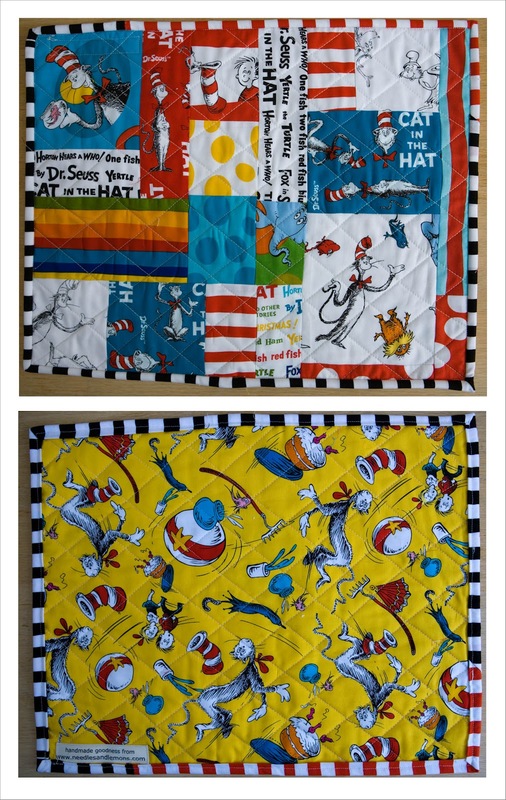 Two of the mats have a print on the back with my favourite being the yellow one and for the third back I used two of the larger project sheet items that came with the fat quarter bundle. 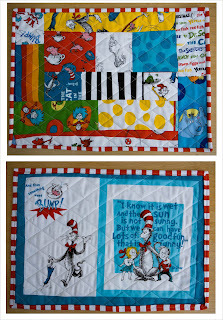 One of the mats is for Lucas and I wrote on the back in ink the date of his first birthday and one of the other will go to my nephew Hauke who will turn 3 next week. The third one will go in my newly created baby/toddler present stash. 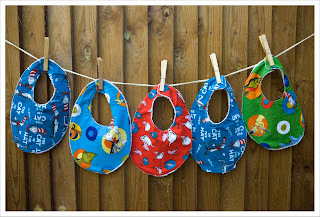 I think bibs are a great present and are so easily done once one gets over the unbelievable mess the terry cloth (or towling as we call it here) makes. 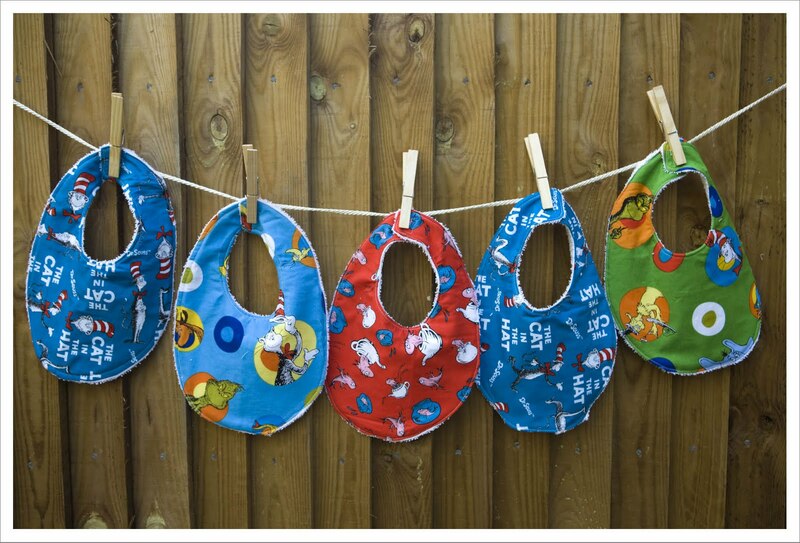 I searched for a template for the bibs but couldn't find the right size anywhere. So I made my own and tested it on my neighbours baby. You can download my own template here if you wish. 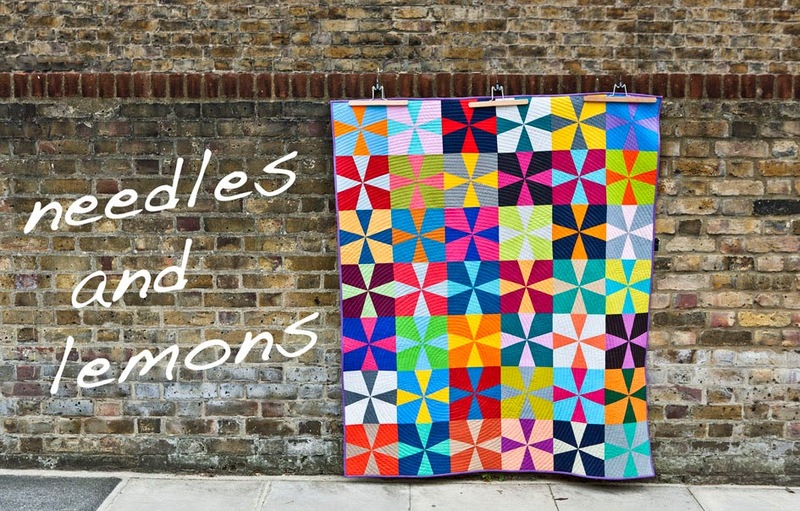 Just cut both shapes out, join them together with tape and your template is ready. Put the template on your fabric and trace the outline, cut it out with a 1/4 inch seam allowance, then place the cut-out fabric template onto the terry cloth and cut along the outline which leaves you with two bib templates, one fabric and one terry cloth. 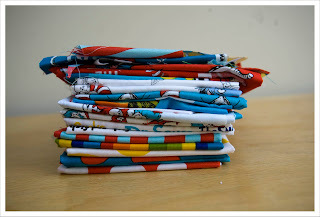 Place terry cloth and patterned fabric right sides together, sew all around except for a small opening that you use the turn the piece inside out. Then close it by sewing along the edge once. 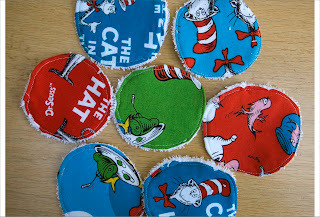 Add some Velcro buttons to the endings. Done ! 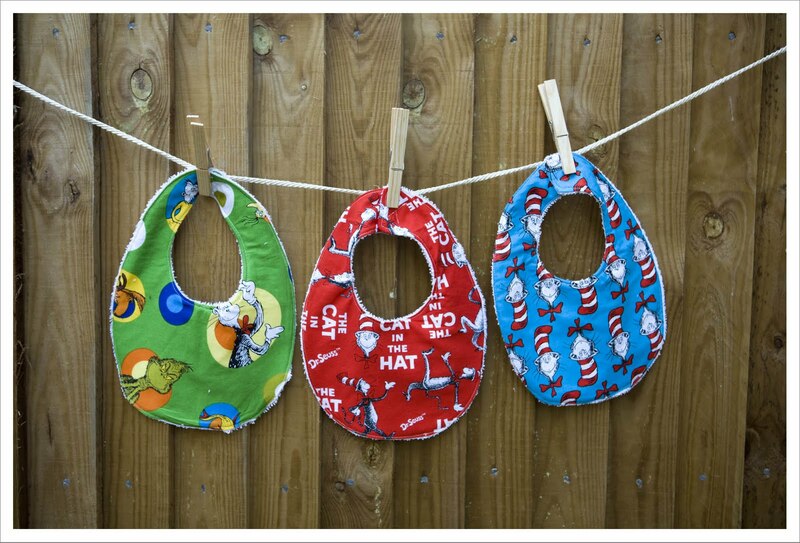 This one here is the slightly larger size hence why I call it the 'feeding' bib. I made these first with a template I downloaded from Purl Soho but found that they are a little on the small side for feeding purposes. 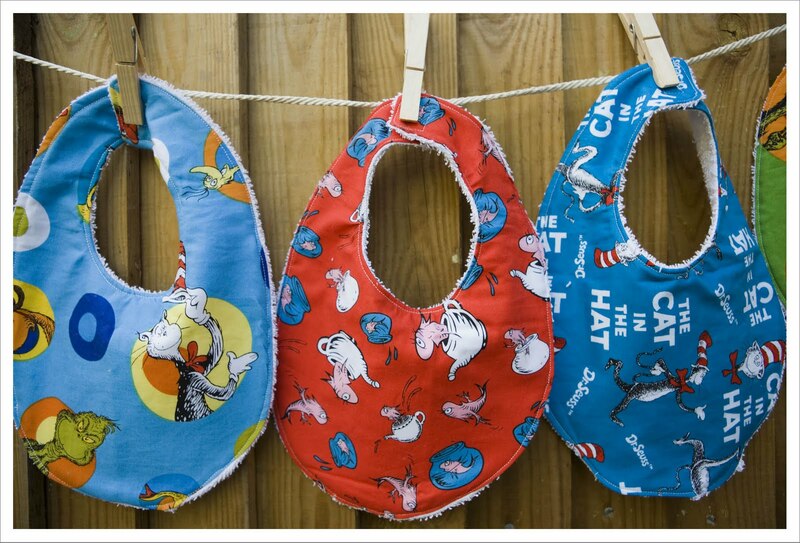 But they are dead useful for dribbling, teething babies. These I almost like the most as they are so handy. Same technique as the bibs except that I cut out square shapes randomly. They can be used as wash and/or burp cloth. 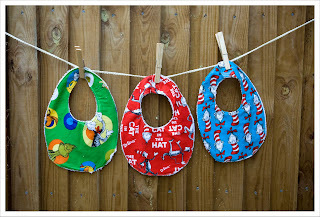 I know this is a bit silly but when I cut out the baby bibs I was left with the inside of the neck opening from the patterned fabric and terry cloth and thought it a waste to throw it away. 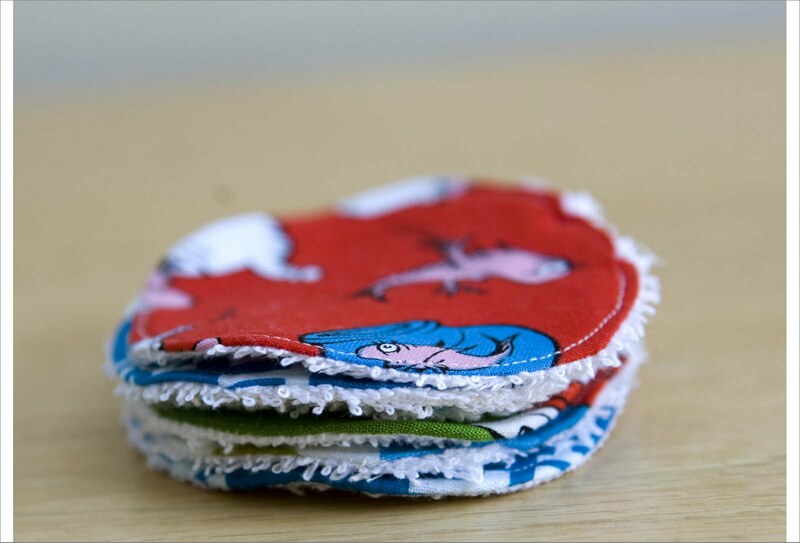 So I came up with these mini-one-burp-cloth sillies...... probably not useful at all but cute. Sometimes I just loves silly. Well and when one makes presents one also writes a card. 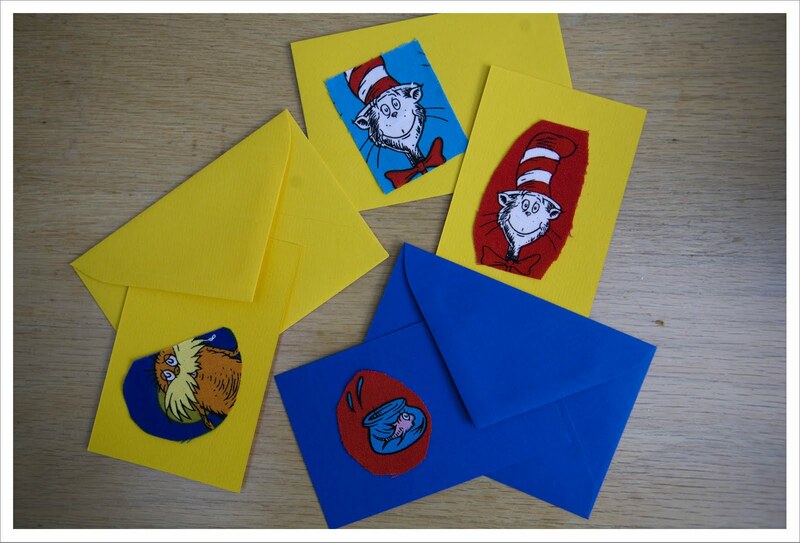 So I used some of the leftovers and glued them onto little coloured cards I can add to the presents. Aren't these cute. 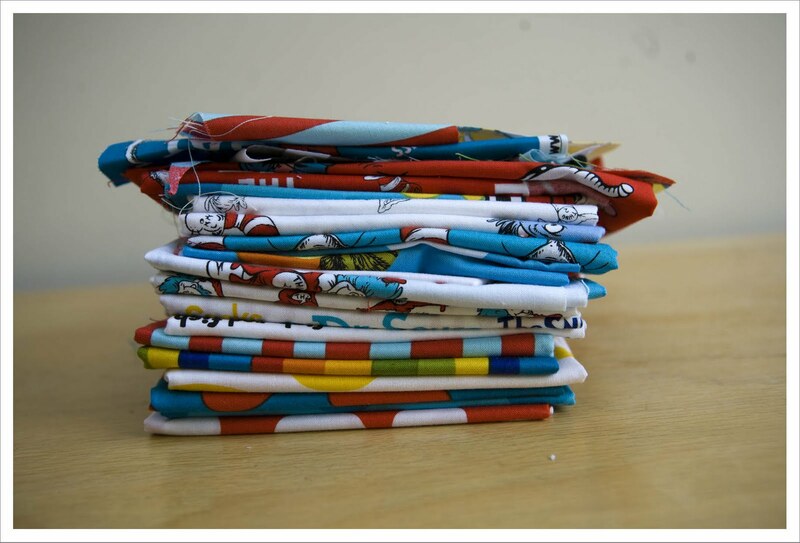 And after all that I thought most of my fabric would be gone but look how much is still left of the fat quarter set! I guess a few more placemats then but not for the moment ! 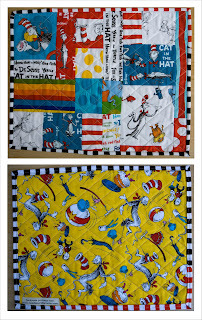 I need something grown-up and am already quilting my 'Hey Ho Sailor' quilt. Phew......thanks for bearing with me and no I am not apologizing for the amount of images as I am so happy with my little things. You can find even more on my flickr page. Wow!! The Dr Seuss factory looks fantastic! What lucky babies! 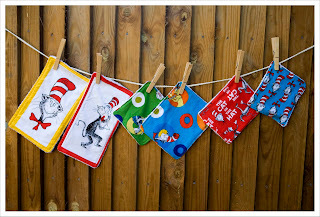 You have made some wonderful gifts there and as the babies grow into mini people they will will love them even more because they have Dr Seuss on them. Those small round pieces could be the perfect size for reusable nursing pads! Thanks for sharing how to make these! 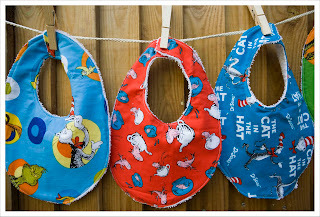 I love to make stuff for baby gifts like Baby Bibs. I used to make sweet dollies for baby girls but I kinda got out of the habit and now my sewing machine is put away. I will get it out again this coming fall/winter when there's snowy days and we're stuck indoors. :) You are so crafty, and I look up to you for being such a great home-maker for your family. 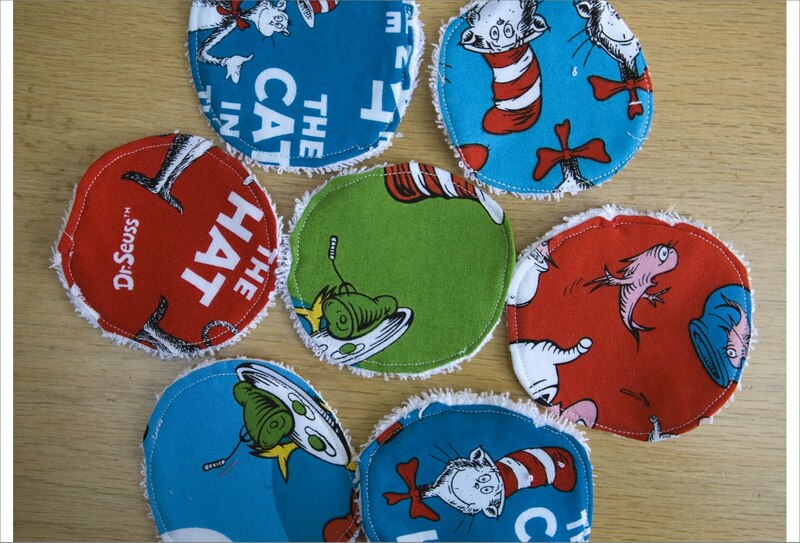 honestly your one birp use circle cloths look a lot like nursing pads!!! I thought they were when i saw them on google images! there's you an idea too!